A compact book case able to fit into a themed area and hold a bespoke collection of books. Designed to vertically display a range of books but also fit into smaller areas. With thanks to Dukes and Duchesses Nursery for this suggestion. We were asked to create a smaller, compact bookcase that could hold a small selection of books that the children could easily access independently. This fantastic design is the perfect addition to any setting. 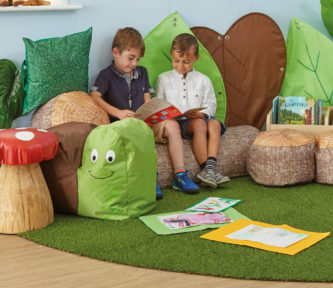 Create cosy areas themed around the child's interest and inspire them to read.